One of my collies loves to bark at almost anything at a nighttime. I couldn’t believe how quickly and effectively the Dogtra YS300 controlled the barking problem. Unit is compact, lightweight and easy to use. Good in thick scrub and picks up dogs in gullies no problems. These collars are great on Mastiffs. I have experienced instant results. Complete bark control for big dogs. I have an escaping boxer that loved to roam everywhere. I don't want to keep him indoor or on a chain all the time. The invisible dog fence is the perfect solution. Supplying Barking Collars, Dog Fences, Training Collars, GPS Tracking Collars. Paul, The "DogMaster" has been a Dog trainer involved with dog training collars for almost 20 years. DogMaster is Australia’s biggest independent distributor of quality barking collars, dog fences, dog training collars, dog doors, GPS dog tracking systems & citronella bark collars. We offer all leading brands Dogtra, Tri Tronics, Garmin, Num'axes, PAC, Nemtek & Petway. Our average dog training collars, dog fencing systems or bark control collars produce approx.2 volts @ 20 milliamps correcting your dog,Yes, that small. We will Beat Any Advertised Aussie Price Guaranteed! & you get Aussie FREE CALL helpline and Aussie Warranty. Whats Hot and New at DogMaster? Garmin is here ! 8 years ago Garmin Ltd purchased long term e-collar manufacturer Tri Tronics. TT were the original manufacturer of e-collars in the USA, with many outstanding models such as the Classic 70 and Bark Limiter. TriTronics e-collars originally dated back to the 1960's. Garmin now brings its quality name, R & D and quality build to e-collars through Dogmaster. Dogmaster is now an official distributor for Garmin Dog Products in Australia & New Zealand. Check out the new Garmin Delta Sport XC, the Garmin Delta XC and the Garmin Barklimiter 2 and Garmin Delta Inbounds wireless fence. Want to track your dog? check out the Garmin Astro 430 and Garmin Alpha 100 for your dogs. The new Garmin mini range tracking collars are suitable for small working dogs and hunting dogs from 7kg. The TT15 mini is the smallest GPS tracking and training collar on the market. Garmin GPS Personal Handhelds are available at DogMaster Trainers now. They are great tools for outdoor adventurers who love getting back to nature. Most of the Garmin Handheld GPS have a rugged tough design and an IPX7 water proof rating. They are made to last in extreme Australian outdoor conditions. Whether you are heading into outdoor camping or sports, Garmin Handheld GPS are great handy devices to locate you and your friends, keep your tracks and communicate with your friends. The eTrex series is the basic personal navigator with paperless Geocaching. The GPSMAP 64(s) is the latest Garmin GPS handheld with most advance technology. The GPSMAP 64S has wireless connectivity with smart phone notification features. The Rino 750 two way radio is the combination of "Walkie Talkie" and GPS navigating. So you can talk and locate your family and friends easily for outdoor activities. By the end of April 2016 Dogmaster has achieved an Approximate 79 % decrease in our carbon footprint in comparison to our 2006 - 2007 standards. We have reached this target by replacing older technology unleaded fuel vehicles with modern smaller capacity turbo diesel vehicles, installing solar electric panels onto 2 factory / offices, installing wind generated air venting, office insulation, energy efficient LED factory bay lighting, Energy effecient Air Cond, LED fire exit signage & office LED lighting & window tinting. Dogmaster has now been in business for over 16 years, so you know you are dealing with someone reputable who cares for the environment. One of our Aims has been met, we got our first electricity bill where the supplier owes us $$ in November 2016. And while on the subject of power... How much energy does a typical static bark control collar deliver to your dog? ANSWER: A really small amount, About 2 VOLTS @ 20 Milliamps ! CUSTOMER SERVICE YOU CAN TRUST! Read what our customers are saying through TESTIMONIALS. We are committed to finding a solution for your pet problem; from selecting the right product, to offering a 90 Day Upgrade Warranty* or discussing your situation with our Service team for the best advice. Whether it’s for your own dog or a neighbour’s dog, we have an extensive range of anti bark collars and dog barking collar range, from a citronella dog collar & static correction collars also known as electric collars. Dog barking collars are the perfect dog silencer to reduce nuisance barking. DogMaster Trainers has the largest range of citronella collars and static barking collars to stop dogs barking in Australia and New Zealand. To assist you to stop the barking dog why not give us a call. Free call 1800 300 364. Dog Escaping ? Need a pet fence or dog containment system? Is your pet one of those ‘Houdini’ breeds? Finding the right electronic dog fence is essential to keep your pet safe. As far as pet fencing, the invisible fence has proven results with the cat fence and dog models available. With an electronic dog fence you have the ease of mind knowing your dog will be safe at home. The famous 10 square mtr dog pens/ dog enclosures/dog runs are a galvanised dog cage kit that comes delivered in a box to your door and with the easy step by step manual to assemble your new dog pen. After some training reinforcement? Would you like to curb some poor pet behaviour and want pet obedience? Take a look at the dog training collar. There are 2 basic types, which come as the electronic dog collar and the citronella collar both are activated by remote control. The electric dog collars are sometimes referred to a dog zapper, dog shock collar, shock collar, electric dog collar or electric collar, no matter what you call them they are a great tool for dog training and dog obedience. Don't be concerned about using an electric stimulus, its only about 2 volts @ 20 milliamps. We have several Dogs door and cats door options if you want your dog or cat to have access into a room or into and out of the house. if you need a doggy door or cat flap see our Dog Door and Pet Doors page Where we have an extensive range of cat doors & doggy doors with brand such as Staywell, Petsafe & Petway pet doors. If it's pet door installation you are looking for, the Grey Army can help you. They will give you a reasonable quote for the installation of your new doggie door. For further information regarding products for your pets, you can speak with our friendly staff, send us an email or come to our showroom located at Unit 2/6 Nuban Street, Currumbin Waters Queensland. We are open from 8.00am to 5pm, Monday to Friday, and 9am to 12pm on Saturdays. Real People at a real address ! Our business is not just a website. 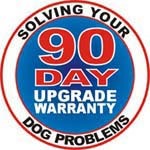 To assist you further, we offer both a 30 Day Money Back Guarantee* and a 90 Day Upgrade Warranty*. This is part of our commitment to you. Further to that, we have established our own Service Dept who can assist you with any manufacturer warranty requirements, as well as provide you with advise and repair work.